Five years ago, our now 17 year old son, Alek, started to have intense stomach pain and headaches. After much testing he was diagnosed with irritable bowel syndrome and was put on a variety of medications to ease his symptoms. Despite this, the pain continued to worsen forcing him to be homeschooled at the age of 14. After three years of chronic stomach issues, Alek began to have migratory joint pain, tendinitis, muscle pain, twitching and cramping, migraines, sleep disorders, night sweats, nausea, swollen lymph nodes, recurring tonsilitis, a vascular rash on his midsection, weight loss and severe brain fog. We suspected lymes disease given we live in a Lyme epidemic area but his CDC Lymes bloodwork came back negative. We spent the next year seeing every specialist at Boston Children's hospital and other hospitals who could find nothing obvious in his bloodwork but told us it was absolutely not Lymes given the negative CDC blood test. Their best guess was fibromyalgia and chronic pain disorder, but all his symptoms spoke otherwise. We started researching and realized the CDC Lymes test has a high false negative, given that it measures our bodies' immune response not the actual presence of Lyme spirochetes, which are masters at remaining undercover and evading the immune system. After much warning from my son's pediatrician who thought "Lymes literate" doctors were quacks and only in for the money, we took our son to a Lymes literate doctor. Given his multitude of Lymes symptoms, they sent his blood to Igenex labs as well as ran another test called the Ispot, which is the gold standard test for Lymes used in Europe. He tested positive for Lymes and three other tick coinfections: Bartonella, Babesia and Mycoplasma. We treated him first with Doxycycline and his migraines stopped as well as his chronic stomach pain that he had suffered with for so many years. We knew we were on the right track despite every doctor still insisting he did not have Lymes. However, we had wasted so much time due to faulty testing and doctors missing the obvious that Alek's Lymes disease had become systemic and has become very difficult to treat fully. Because the state of Massachusetts and most states in the U.S. only recognize Acute Lymes disease and turn their back on Chronic Lymes disease, we are forced to pay out of pocket for treatments to help our son. Thankfully, there are many Lymes literate practitioners who understand Chronic Lymes and treat it quite successfully. However, they can not operate within insurance guidelines and costs begin to add up quickly. To say that Lymes and it's coinfections are difficult to treat is an understatement. It's been nicknamed "The Great Imitator" as it mimicks so many other diseases given it can affect all systems in the body. Lymes also has the innate ability to evade the immune system and form protective biofilms around itself that make antibiotic penetration difficult. This makes treatment even more challenging. To make matters worse, Alek has had adverse reactions to most antibiotics given his toxicity levels are so high from the endotoxins these pathogens release. This toxicity has created damage to his muscles, joints, adrenals, brain and immune system and has prevented us from using a more aggressive approach. Although we have made gains in some areas with our Lymes specialist, we have a long way to go. Given my son is losing his ability to use his arms and legs and his pain levels are still very high, we will be traveling to NYC every week to another Lymes doctor, who specializes in toxicity and immune issues caused from Lymes and coinfections. Alek's treatments in NYC will cost about $1200-$1500 per week not including medications to take at home or the cost of traveling. We estimate the cost to be about $2000/week for at least 5-6 months. We have already accumulated well over $100,000 in debt for Lymes all the while paying our health insurance bill out of pocket, which is essentially of little use to someone with Chronic Lymes. 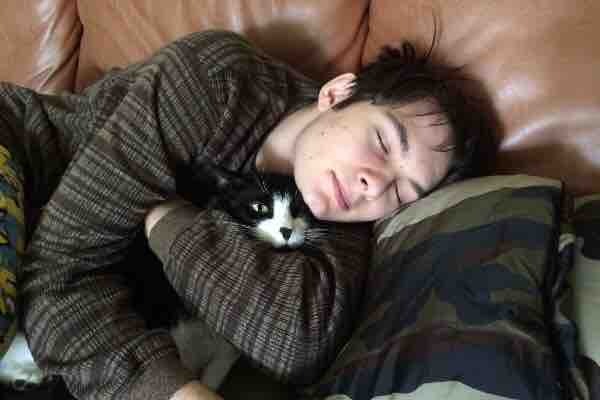 The pain and suffering that Alek has endured is indescribable. Watching him go thru it is even more devastating. Yet somehow, by the grace of God, he manages to keep his gentle spirit, put on a smile, and keep fighting. Most would give up if they had to endure the nerve, muscle, and joint pain that he endures on a daily basis. Not to mention the bouts of tonsilitis that occur every 28-35 days, which have left his tonsils scarred and needing removal. Despite the ongoing battle, we continue to push forward with hope. Hope that God will do a miracle, and hope that we will be able to get him the medical treatments he needs. We are asking for your prayers and financial support to help Alek to have the resources needed to keep fighting. Please help us to afford the care Alek needs in NYC to address his toxicity and immune issues so that we can be able to more fully address his infections. He is desperate to know what it's like to be a normal, healthy teenager- to run, climb, hang out with friends, eat normal pizza and real sugar, play airsoft, go outside without fear, to live, to laugh, to learn, and to be free. Free from pain, free from infection, free to serve God. Many Blessings and gratefulness for whatever you can contribute! THE MATCHING CAMPAIGN WAS A HUGE SUCCESS!!! Dave, Alek and I wanted to express our heartfelt thanks to those who donated during the matching campaign❤️... and a very big thank you to the generous donors who matched and our dear friends who organized it all! It allowed Alek to be treated thru February and will allow some treatments in March as well. His last blood work showed significant progress, but we still have quite a ways to go given the length of time he was undiagnosed and the systemic nature of this disease. The hope that your generous giving has brought to our family is indescribable. 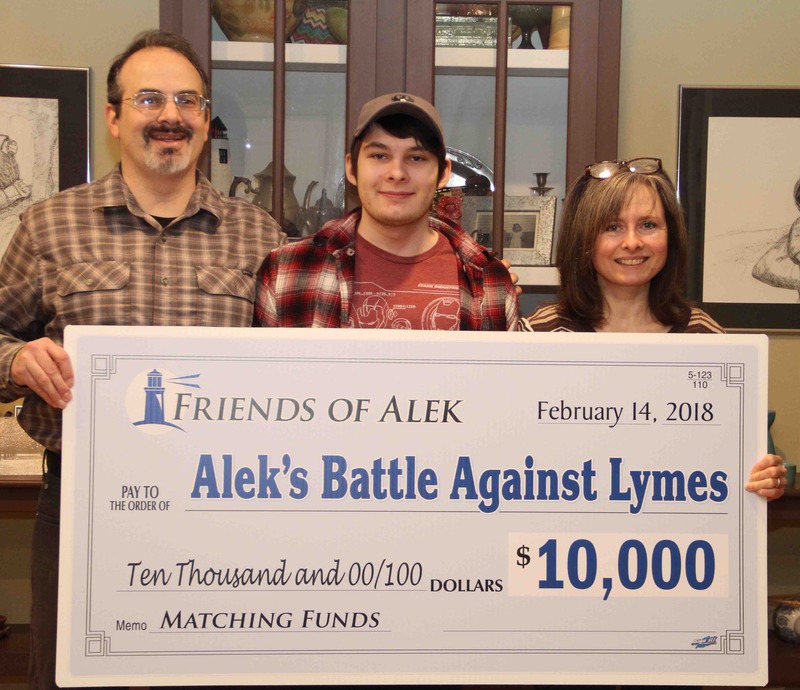 Please continue to partner with us by sharing Alek’s Battle against Lymes GoFundMe campaign via text, email and social media so that Alek may continue his weekly treatments in NYC. Your giving is greatly appreciated! Great news!!! We have matching funds on new donations from February 1st- February 14th! Hi friends and family:) Dave, Alek and I wanted to say thank you to all who have given to the "Alek's Battle against Lymes Disease" campaign. We are overwhelmed by your generosity and are so appreciative as you have allowed our son to receive treatments for another month. 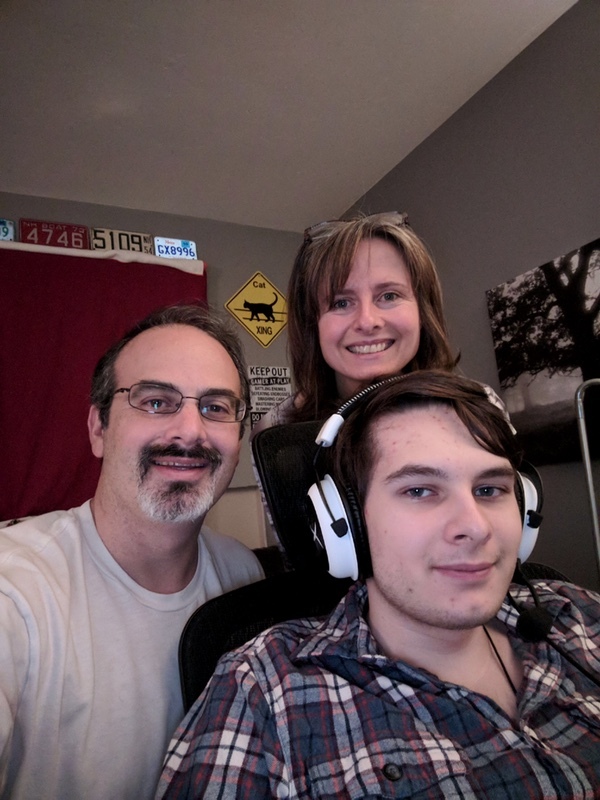 With our new Lyme doctor in New York City, my son is tolerating treatments for the first time in two years and slowly improving which is a huge breakthrough! He has a long way to go, but we are hopeful given the recent progress he's made. Very kind and dear friends of ours have arranged a matching campaign that will go from February 1st thru February 14th. Generous donors will match whatever is contributed to Alek's campaign up to $10,000! We're believing God to surpass that goal exceedingly, as the CDC does not recognize Chronic Lymes Disease, and Alek's treatments are very costly. We are asking you to contribute if you can, or to share Alek's Gofundme link thru social media, email or text to maximize our donations thru February 14th. Over the last two years, we have depleted all our resources on fighting Lymes and are now depending on other's generosity to continue treatments. Thank you so much for whatever you can contribute to help our son, Alek, continue his Battle against Lymes Disease!